May 5, 2016 – The Aerospace Corporation has been monitoring the accuracy of the Global Positioning System (GPS) constellation in realtime since 2002. Last month, on April 25, the GPS satellites recorded their most accurate day in the history of the constellation with what is called a user range error (URE) of just 38 centimeters. Aerospace computes the error in measuring distance to every GPS satellite using data from a worldwide, NASA-owned, Jet Propulsion Laboratory-operated network of GPS tracking stations, according to John Langer, associate principal director, Strategic Planning Office. From this data, Aerospace computes the daily URE for the GPS constellation. The URE is related to the accuracy of GPS on Earth’s surface. Atomic clocks ensure that the data used to compute the range to a given satellite are accurate. Better atomic clocks on GPS satellites mean better accuracy for GPS users, and the Block II clocks are the best-performing clocks ever flown, according to Langer. Originally designed to operate with a URE of six meters, GPS today is performing at about 50 centimeters URE. The most accurate day last month was illustrated by Dr. Dave Gorney, executive vice president, at a special GPS IIF recognition event on Tuesday, May 3. 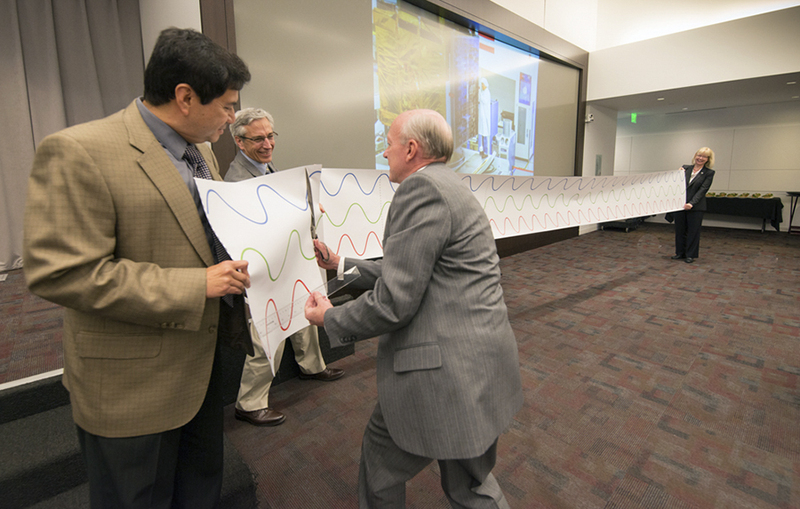 He began with a six-meter-long paper banner (about 20 feet) which represented the original URE for GPS. There were three sine waves on the strip, indicating the three frequencies provided by the Block IIF satellites. Gorney then marked off a distance of just 38 centimeters – about 15 inches – and cut it with scissors, illustrating the importance of Aerospace’s involvement with GPS performance. “With the fine clocks of the Block IIF satellites, and the even better clocks that will fly on the new Block III satellites, we can look forward to more record-breaking days in the future,” Langer said. GPS is operated on the ground by Air Force Space Command’s 2nd Space Operations Squadron as a component of the 50th Space Wing – known as the “Masters of Space” at Schriever Air Force Base, located nearly 10 miles east of Colorado Springs, Colorado. The GPS constellation is maintained by 2 SOPS (and their Air Force Reserve counterpart, the 19th Space Operations Squadron) as a global utility seven days a week, 24 hours a day for the benefit of everyone worldwide, courtesy of the U. S. Air Force.